Growing evidence that the Syrian government of Bashar al-Assad may have used chemical weapons against its own people has led to calls for the Obama administration to intervene in the Syrian civil war. Such exhortations seem to be out of step with much public sentiment in the United States, in Europe and in the Middle East. Just 45% of the American public favors military intervention in Syria even if it is confirmed that the Syrian government has used chemical weapons against anti-government groups, according to a new poll by the Pew Research Center conducted April 25-28, 2013 among 1,003 adults in the United States. About three-in-ten Americans (31%) oppose such military action. And 23% has no opinion. But just 18% of the public say that it has been following news about the Syrian chemical weapons issue very closely. A separate Pew Research Center survey conducted in March before information emerged of the alleged use of chemical agents found nearly two-thirds (64%) of Americans were against even arming the Syrian rebels. And there was even less support for such involvement in Europe. Eight-in-ten Germans (82%) opposed such assistance, as did more than two-thirds of the French (69%) and a majority of the British (57%). Even the Turks (65%), who share a border with Syria and now house 300,000 refugees from the civil war, oppose military aid to the rebels. Publics in the Middle East are even less supportive of the West getting involved. In five of the six countries that were surveyed in March in the region – Lebanon (80%), Turkey (68%), Tunisia (60%), Egypt (59%) and the Palestinian territories (63%) – publics opposed Americans or Europeans supplying the Syrian rebels with weapons. Only in Jordan (53%) did people back Western intervention. Most publics in the region do not even want their own governments to get involved. 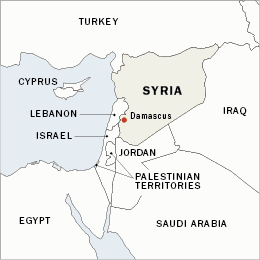 Only the Jordanians (65%) support Arab countries sending arms and military supplies to anti-government groups in Syria. The Turks (66%) and the Lebanese (60%) are particularly opposed. The news about the alleged Syrian use of chemical weapons may yet change public opinion. As in any war, facts on the ground can affect public sentiment. But, so far, pleas from American pundits and politicians have failed to rally majority support for such action in America, Europe or the Middle East.